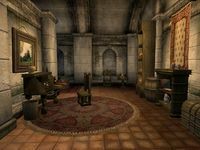 Sevarius Atius' House is a house in the Talos Plaza District of the Imperial City. 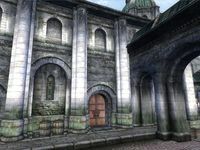 The house itself is situated in the southwestern part of the district, neighboring Helvo Atius' House and adjacent from Dorian's House. It is the sole residence of Severius Atius, and consists of three zones; Sevarius Atius' House, Sevarius Atius' House Private Quarters, and Sevarius Atius' Basement. 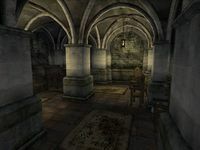 The entrance level has a staircase on the north wall that leads up to the private quarters with two clutter sacks by the door. In the northwest corner of the room is a door to the basement. Also in this corner is a barrel containing food. A sack at the foot of the stairs contains clutter, the cupboard next to it contains food, and the table next to it holds eight radishes and a piece of venison. In the southwest corner, a table is set for four with three pieces of venison, eleven radishes, and two bottles of cheap wine. A food barrel and three pumpkins sit behind the table. Along the south wall, there are two barrels, two sacks, and a chest that all contain clutter. On the north wall next to the door is a desk which holds a bottle of ale, a bottle of Cyrodilic brandy, and the books Frontier, Conquest and Guide to Cheydinhal. His single bed and a chest at the foot containing gold, jewelry, and clutter can be found in the alcove in the northeast corner. A chair and table with a sweetcake on it can be found in the southwestern corner (see Bugs). Along the south wall is a barrel and a sack containing clutter and a chest containing wepaons and/or armor. A bookcase with a few books on it also sits along this wall. The basement of the house does not contain anything of major value. A clutter chest and sack is on the landing of stairs directly in front of the door. In the basement itself, there is a clutter barrel and sack in the southwest corner, four clutter crates and another clutter chest in the northwest corner, and a food barrel and clutter barrel in the northeast corner. Another clutter sack sits against the east wall, and two food sacks sit against the center pillar. The key to the house is carried by Severius. The chest at the foot of the single bed in the private quarters is the only container in the house that is non-respawning. 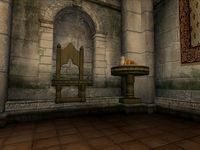 Both the chair and table in the southwestern corner of Sevarius' private quarters are floating. 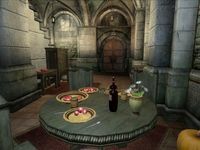 The naming of Severius is inconsistent within the game; both his house name and NPCs incorrectly refer it as Sevarius. This page was last modified on 8 July 2018, at 12:29.